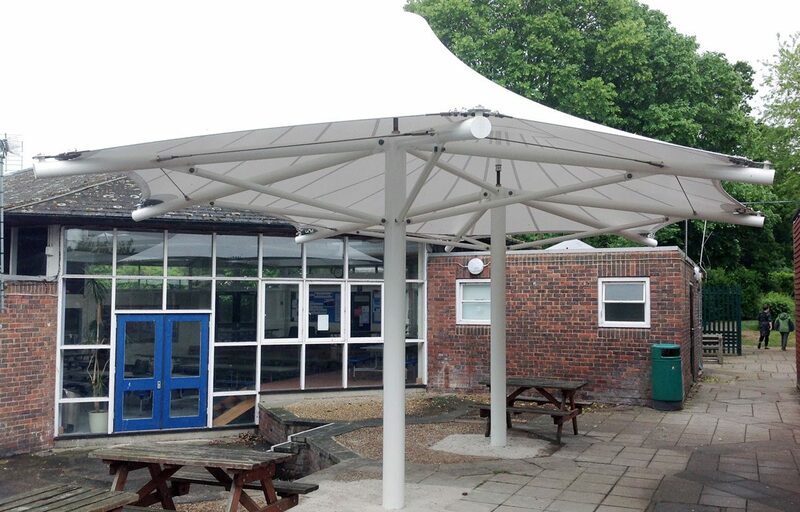 Twin conic tensile fabric canopy for Steyning Grammar School. Completed in summer 2013, this twin conic tensile fabric canopy creates a sheltered seating space for pupils at Steyning Grammar School. The twin conic is one of our pre-designed tensile fabric canopies, a practical design that is ideal for a school or college environment. We also offer a full tensile fabric design service for more bespoke solutions. The steel structure is CE marked which attests the verification by Fordingbridge that these products meet EU safety, health or environmental requirements. Dimensions: 6m x 8m. This structure is also available in 8m x 10m.